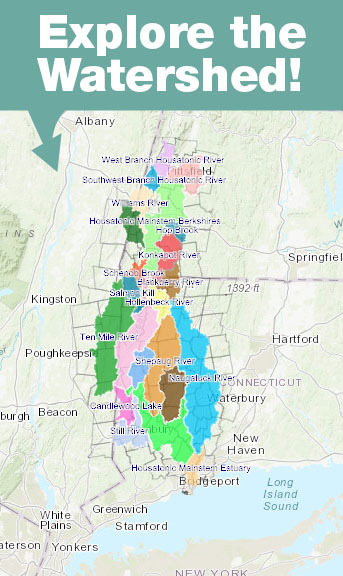 Stretching 149 miles from its source in the Berkshires south to Long Island Sound, the Housatonic watershed encompasses the “mainstem” river itself, along with dozens of tributaries, streams, lakes and ponds. The watershed spans just under 2,000 square miles – an area even larger than Long Island Sound! This watershed can be broken down into 24 distinct “sub-watersheds,” each with its own defining characteristics, and its own distinct challenges. More about the Housatonic Valley! Source: Confluence of East & West Branches, Pittsfield Mass.